We've been hearing about the 2011 Ford Fiesta for so long that it's hard to imagine that the U.S. version of the car was just officially unveiled today. We gave you all of the official details and photos late last night, but we can now give you our first live impressions of the North American-spec version. 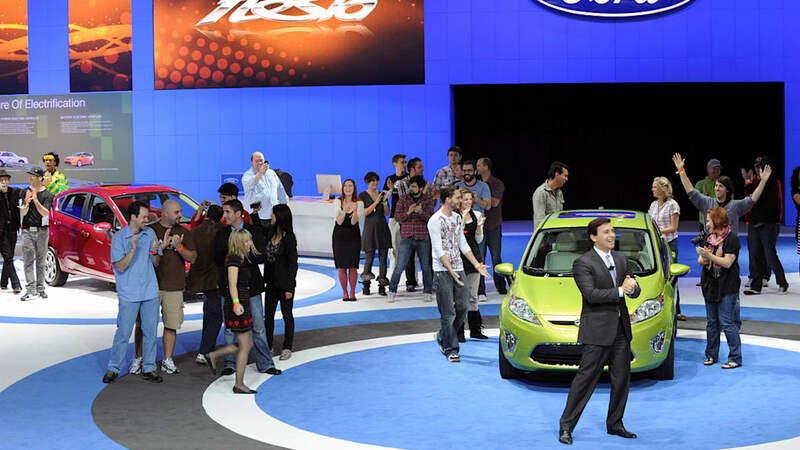 Ford's own Mark Fields officially introduced the car along with numerous Fiesta agents on hand who helped pull the sheets off the various Fiestas on the show floor. Although just 60 percent of the parts on the U.S.-spec Fiesta are common with the European version, it seems that most of the charm of the car remains. Up front the grille has been revised to include the three-bar design (at least on the sedan), and the fog lights have been replaced by LED light strips surrounded by chrome. The interior design is relatively the same as well, although it's been tweaked to conform with U.S. crash standards and features soft touch materials, a four-inch LCD display, and available SYNC, auto climate control, leather seats, moon roof and more. Power comes from a 1.6-liter four-cylinder putting out a respectable 119 horsepower and 109 lb-ft torque. 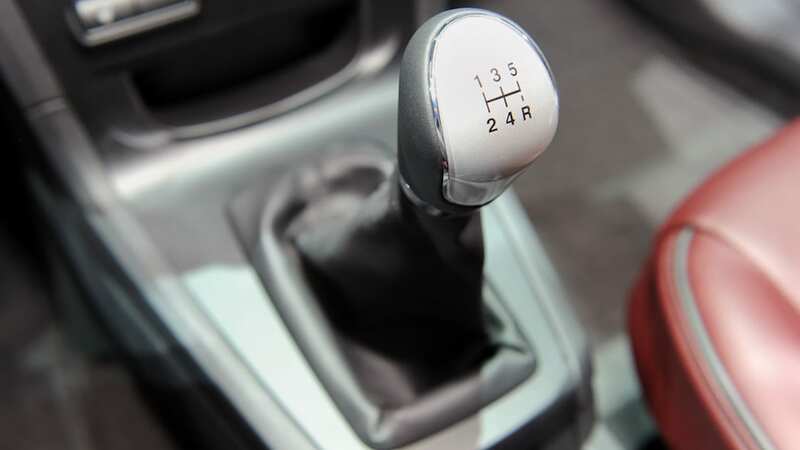 A 5-speed manual or new 6-speed PowerShift electronic dual clutch automatic will be the transmissions of choice, though the automatic goes without any manual controls. There's plenty of more details in the multitude of press releases after the jump, and we've included all of our live shots of the 2011 Fiesta in the high-res gallery below. Live photos copyright ©2009 Drew Phillips / Weblogs, Inc.
LOS ANGELES, Dec. 2, 2009 – Ford's hot-selling new Ford Fiesta will deliver more than just great looks and top fuel economy of any vehicle in its segment when it goes on sale in North America next year. 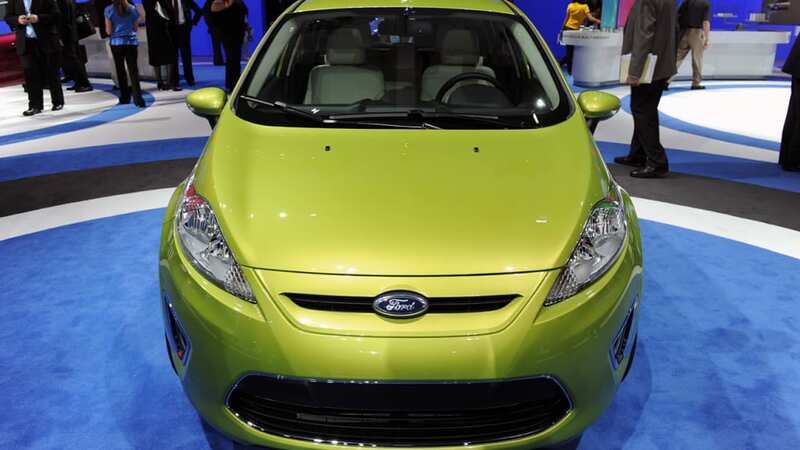 The 2011 Fiesta – available in four- and five-door body styles – also will set a new small car benchmark for safety, connectivity and powertrain technology. "Customers are savvy. They want expressive cars that deliver not just great fuel economy but also high quality, new technologies and a fun driving experience," said Mark Fields, Ford president of The Americas. "We plan to answer the call with Fiesta; an all-new vehicle in North America we hope will set a new standard for small cars." "Fiesta was developed with customers, not just for them," said Derrick Kuzak, group vice president for global product development. "Fuel economy, spirited performance and efficient use of space are universal desires, across global markets – and Fiesta delivers." Kinetic design imparts a sense of movement – even while standing still – harmonizing character elements to reflect global Ford identity, enabling Fiesta to project its own air of confidence, style and individuality. Fiesta targets a youthful "design progressive" mind-set, a consumer group that values style and diversity as worthy assets. "These influential, prospective Fiesta customers relate to the design philosophy of 'energy in motion' because it reflects their personal outlook and lifestyle," said Kevin George, Fiesta design manager. At the rear of the car, many design elements merge, including the chamfered rear liftgate glass, the low roofline sweeping into a spoiler and dramatic taillamps with honeycomb detailing mounted high in the five-door's corners. 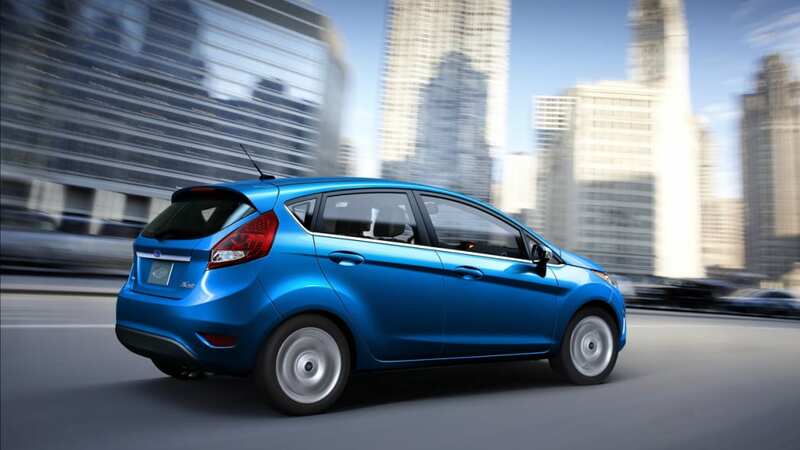 Muscular rear quarter panels, wrapped tightly, draw the eye to the wheels and Fiesta's confident stance. 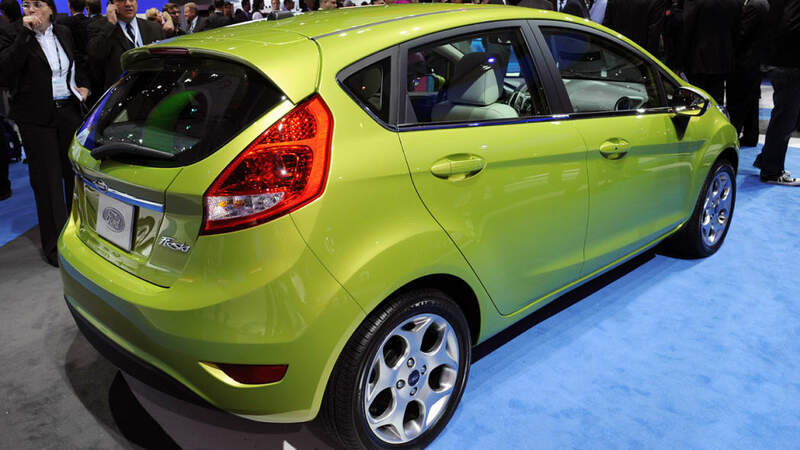 The Fiesta design is further enhanced with a choice of nine vivid new colors. 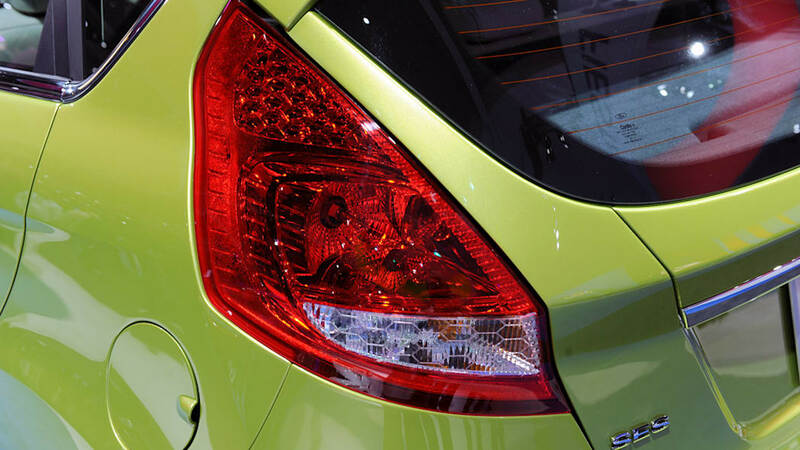 From Bright Magenta through Lime Squeeze to Blue Flame, Fiesta's broad color palette – more available colors than any other segment competitors – instills vibrant individuality. Fiesta is as dramatic on the inside as it is on the outside. Boldly sculpted surfaces, contrasting colors and comfortable, supportive materials make the interior as individual as the driver. 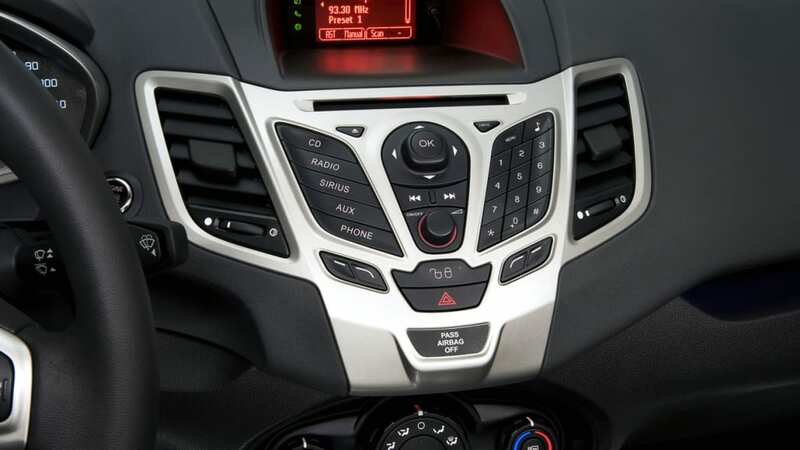 The instrument panel centerstack – focal point of the new Fiesta interior – was designed to feel as useful and familiar as the keypad on a mobile phone. 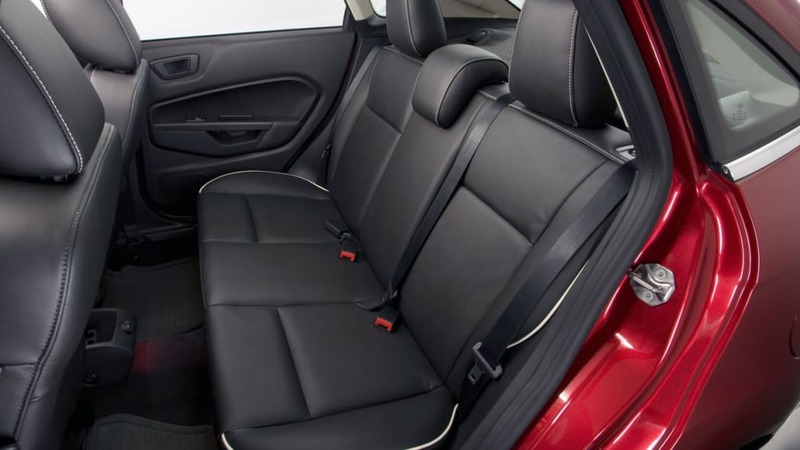 The North American Fiesta features first-row bucket seats with a 60/40 split second-row seat. 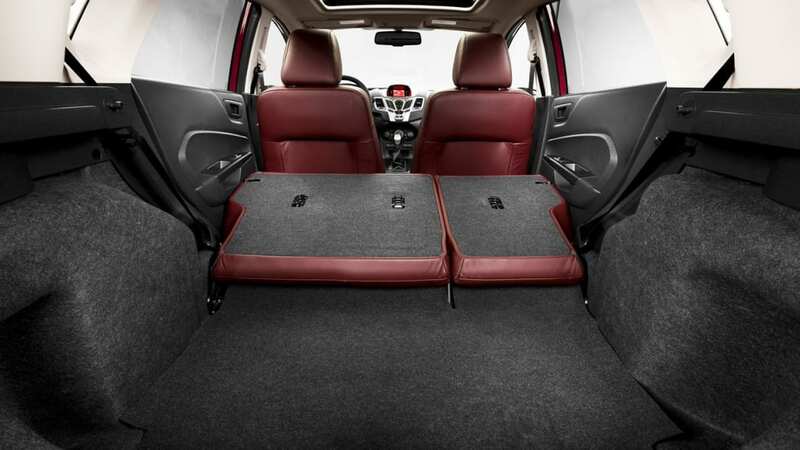 Cloth or leather seating surfaces vary by trim level offering comfort, style and individuality. 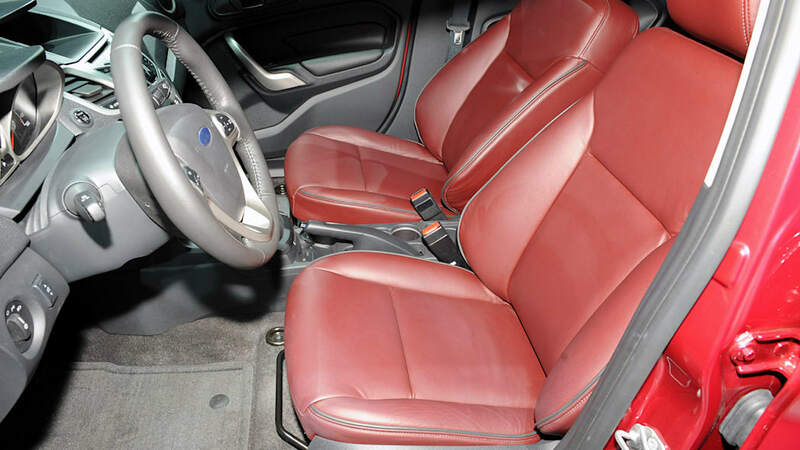 High series Fiestas also offer leather with sporty contrast accent color piping. 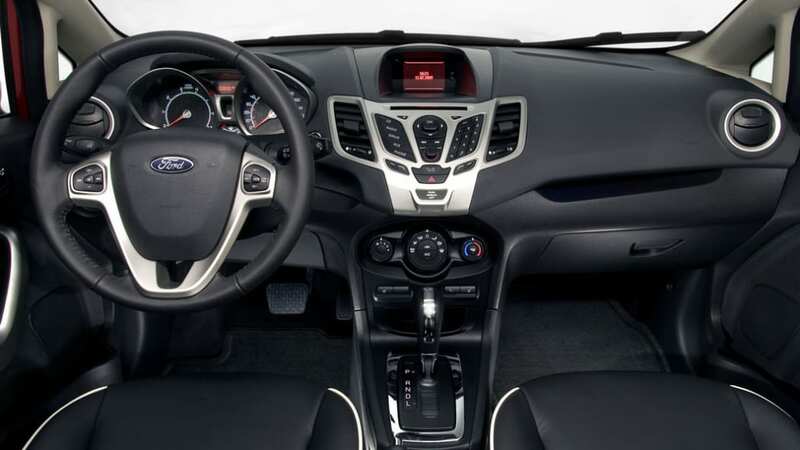 Soft, sculptured surfaces and the centerstack layout provide the Fiesta with a sense of harmony. Intuitive switchgear placement, comfort zone seating and available ambient lighting allow a driver to maximize the mood with seven complementary colors – switchable among three levels of intensity – for interior accent lighting. 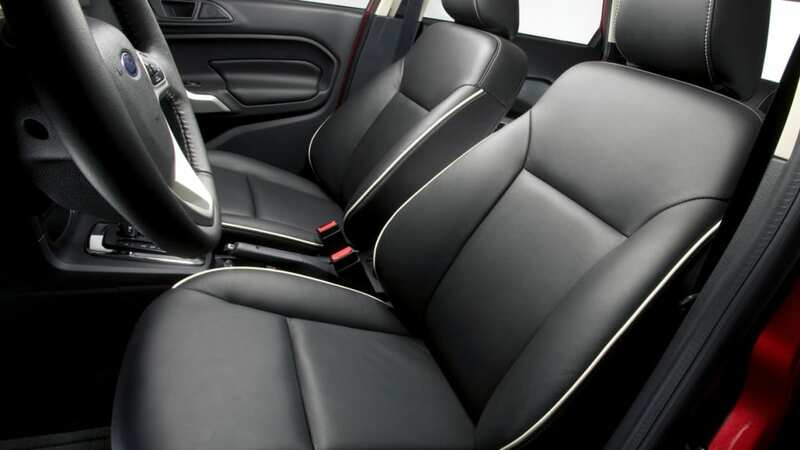 And Fiesta keeps it green; 25 percent of volume series SE seat fabric inserts are comprised of recycled content. 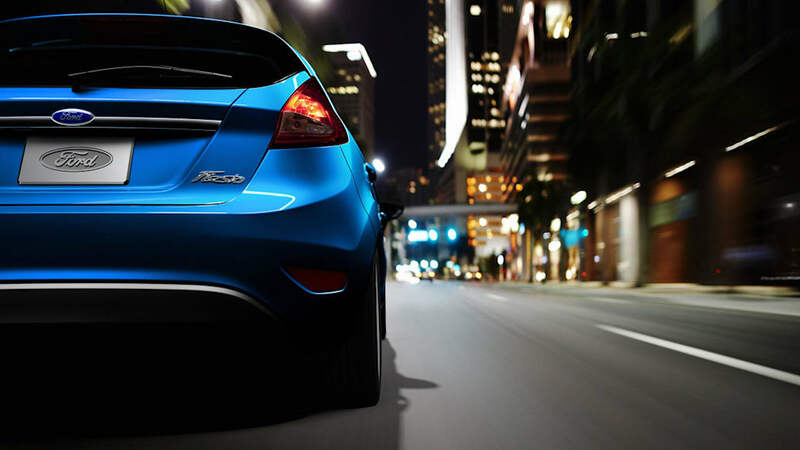 Fiesta's flowing sculpted hood covers a 1.6-liter DOHC I-4 engine with an estimated 119 horsepower and 109 ft.-lbs. of torque. 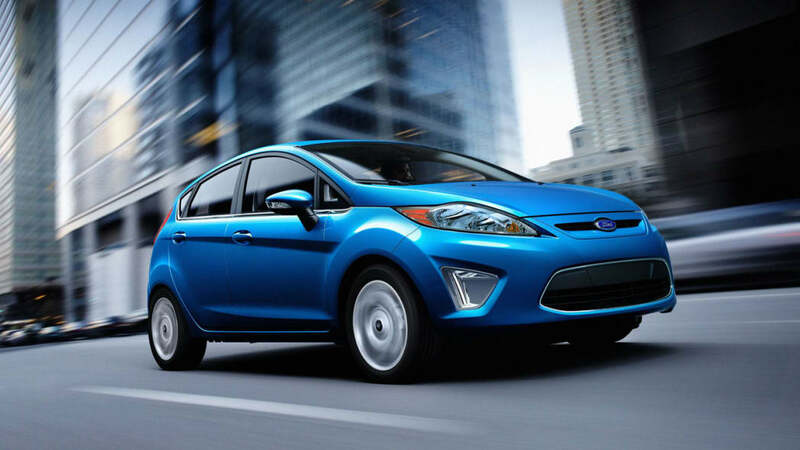 Spirited performance and fuel-efficient economy are signature attributes with the Fiesta expected to deliver best-in-class fuel economy at 40 mpg. Fiesta's advanced 1.6-liter engine features Twin Independent Variable Camshaft Timing (Ti-VCT) allowing the engine to be downsized for fuel economy while continuously optimizing camshaft phasing for throttle response, performance and flexibility. Big results from a small package are possible with several new technologies in this new global engine, including an advanced new front end accessory drive (FEAD) belt with stretchy dynamics to improve the engine's thermal dynamics. The elasticity in this new drive belt eliminates the need for a belt tensioner and contributes to overall fuel economy. 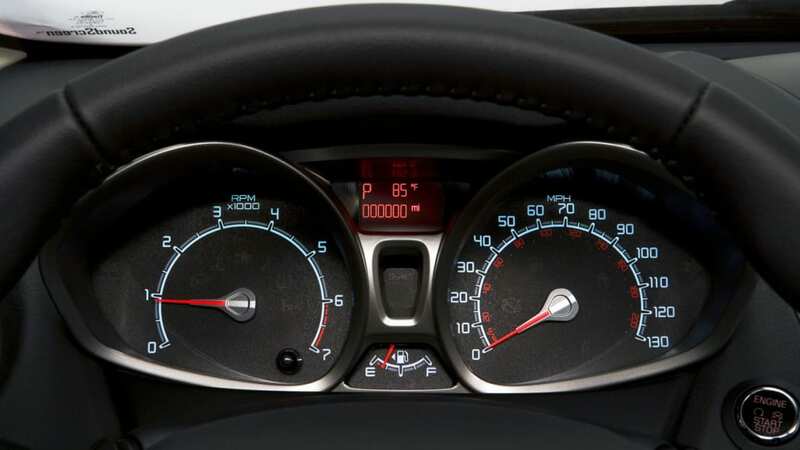 "Fuel economy leaders have traditionally been manual shift models," said Pierro Aversa, team leader for transmissions. 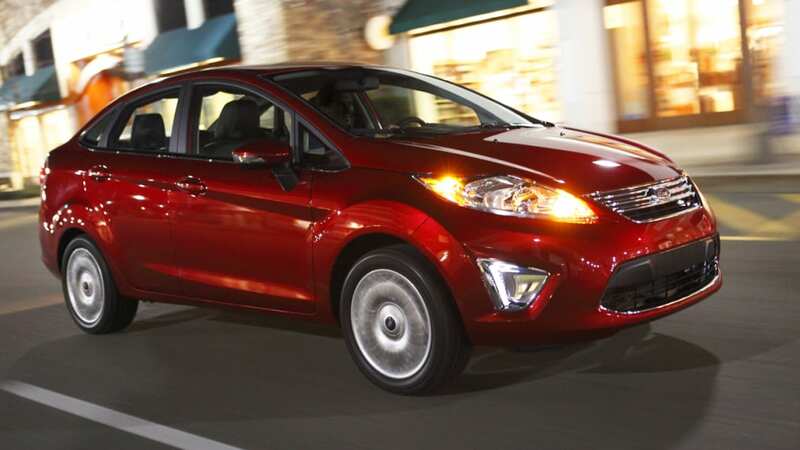 "Fiesta changes the game by offering an advanced PowerShift six-speed automatic that delivers maximum fuel economy." Twin internal clutches keep the PowerShift in constant mesh, always optimizing for maximum responsiveness or fuel efficiency, depending on input received from the driver's foot on the accelerator pedal. This "dry" transmission operates with sealed internal lubrication, reducing internal friction and adding to Fiesta fuel economy. The lack of pumps and hoses reduces under-hood complexity, saves weight and also contributes to fuel efficiency. PowerShift has been proven in Ford's European market and will redefine North American small car segment expectations for responsive shifting and fuel efficiency. 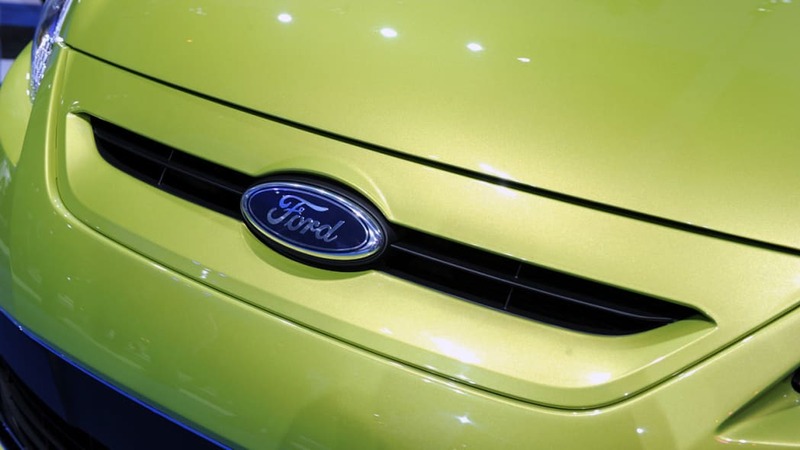 Ford is aggressively moving to EPAS across its product lineup. The system already is available in several Ford, Lincoln and Mercury nameplates, and by 2013 nearly 90 percent of Ford's lineup will offer this fuel saving technology. 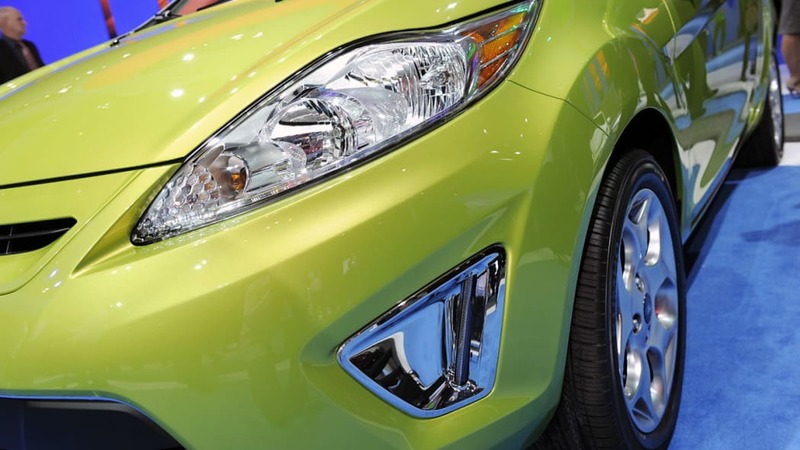 More than 50 percent of Fiesta's welded body structure is made from high-strength steel, with ultra-strong boron steel used in several critical areas. This rigid body shell contributes to Fiesta's confident road-holding, best-in-class occupant safety and quiet composure. 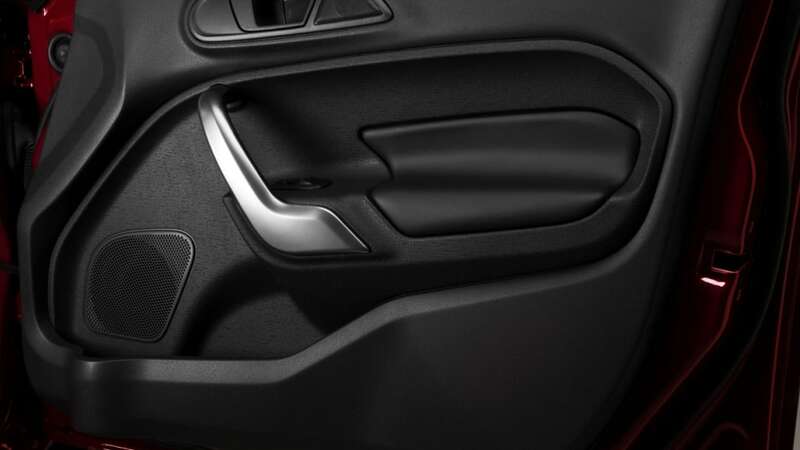 Fiesta safety is enhanced by an array of features including dual-stage first-row air bags, a class-exclusive driver's knee air bag, side air bags and side curtain air bags. AdvanceTrac® with ESC (Electronic Stability Control) is standard on Fiesta, along with seat belt pretensioners, rear door child safety locks and a Safety Canopy® system with rollover sensors. "For North America, the global Fiesta was tweaked, not re-designed or re-developed." said Steve Pintar, chief engineer. "We built on the success of the European Fiesta and are really proud of how little has changed." Much of Fiesta's sound-absorbent materials are comprised of recycled content, helping to conserve resources as it preserves peace and quiet. 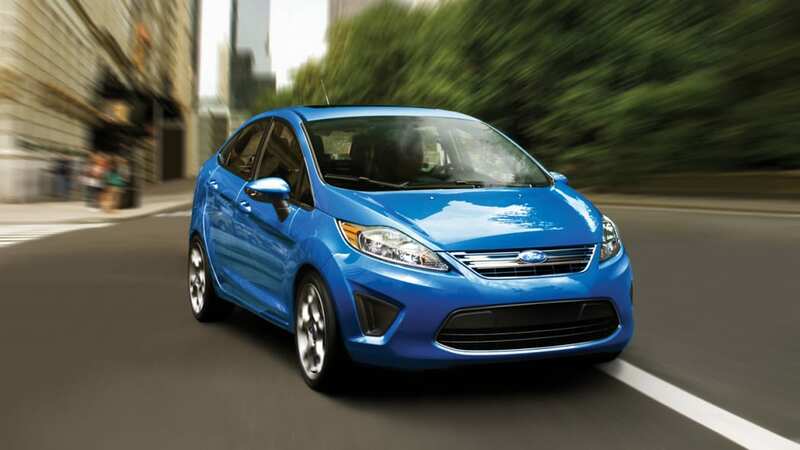 In addition, Fiesta aerodynamics contributes to both NVH control and fuel efficiency. 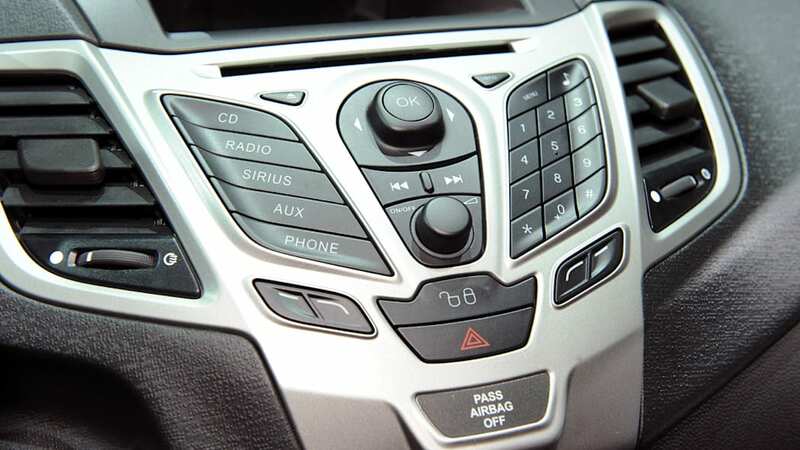 From class-exclusive automatic climate control to a standard aux input, Fiesta offers customers a number of standard and available features that increase convenience and add connectivity. Among them is Ford SYNC®, integrating a driver's mobile phone with Fiesta's onboard, voice- activated communications and entertainment system. Fiesta also offers keyless entry and push button start, a feature unique within the segment. Drivers of all sizes can adjust the tilt-and-telescoping steering wheel to suit their individual preferences. Reflecting Fiesta's versatility and adaptability, adjustable cup holders can accommodate Red Bull cans and Big Gulps along with every container size in between. Fiesta also features Ford's EasyFuel® Capless Fuel-Filler System, a North American industry- exclusive, as standard equipment. 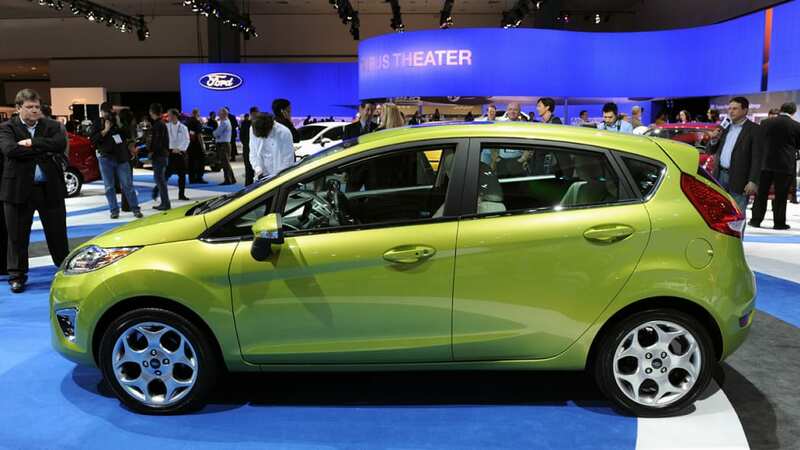 Fiesta is continuing its sales momentum as Europe's No. 2-selling car and Ford of Europe's top-selling vehicle, helping increase Ford's share in Europe's main 19 markets. More than 500,000 Fiestas have been sold since the car was launched last autumn. In Europe, the Fiesta name has long been synonymous with outstanding drive quality, design and value. It's winning enthusiastic media reviews in Asia. 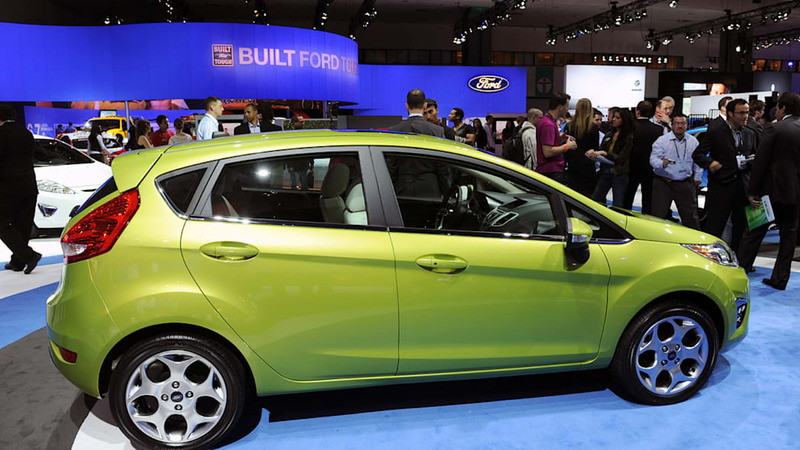 Now, the all-new Fiesta offers North American consumers a stylish, fuel-efficient alternative. LOS ANGELES, Dec. 2, 2009 – Ford Fiesta arrives with a sophisticated drivetrain – striking a balance between responsive and responsible – delivering both European driving dynamics and projected 40 mpg highway fuel economy to challenge the North American small car status quo. "The Fiesta powertrain redefines performance, fuel economy and flexibility for the small car segment," said Barb Samardzich, vice president of Ford global powertrain engineering. "The Fiesta delivers a fun-to-drive experience that will set it apart from the competition." 109 ft.-lb. of torque, giving customers responsive performance. Big results from a small package are possible with several new technologies in this new, global engine. Fiesta features Twin Independent Variable Camshaft Timing (Ti-VCT) which allows the engine to be downsized for fuel economy while continuously optimizing camshaft phasing for throttle response, performance and flexibility. Ti-VCT gives variable – yet precise – control of valve overlap or the duration of time in which both intake and exhaust valves are simultaneously open. Valve overlap management by sophisticated controller mechanisms is critical to eliminating intake and exhaust flow compromises. This technology also optimizes phasing on both intake and exhaust camshafts by spinning them ever so slightly to advance or retard valve timing, resulting in improved throttle response at initial throttle tip-in, reduced emissions at part throttle and enhanced efficiency at higher rpm. The outcome is more power, responsiveness and fuel efficiency from less overall cylinder displacement. During development of this global engine measures were taken to keep overall powertrain weight as low as possible. The block, cylinder head and oil pan – traditionally the heaviest engine components – are aluminum castings. To increase rigidity, these elements are ribbed for additional strength and durability. Pistons are cast aluminum, as well, with the light weight helping to reduce reciprocating mass and adding to fuel efficiency. Composite material is employed to keep intake manifold weight to an absolute minimum while allowing for induction routing to increase thermal efficiency and improve low-end torque characteristics. Another Fiesta powertrain innovation is the new Front End Accessory Drive (FEAD) belt with stretchy dynamics, to improve the engine's thermal properties. The elasticity in this new drive belt eliminates the need for a tensioning device. This decreases under-hood complexity and weight, helps increase fuel economy, and eases belt replacement at specified mileage intervals. 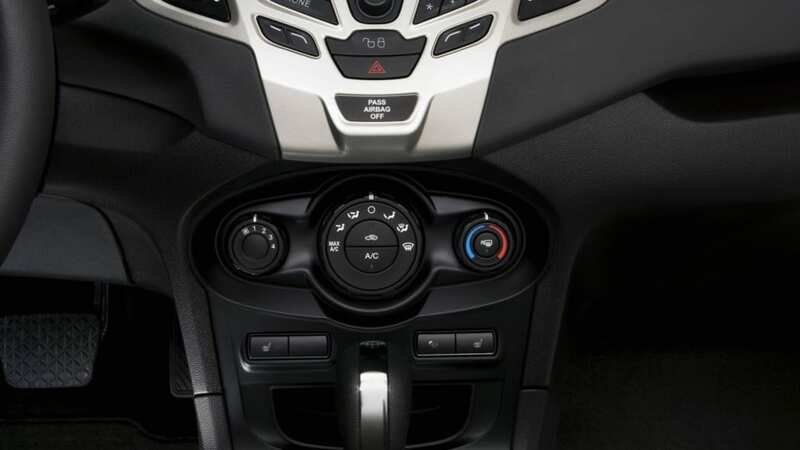 Fiesta launches with an all-new, North American industry-exclusive PowerShift six-speed automatic transmission combining the responsive performance of a manual shift with the convenience of a traditional automatic. 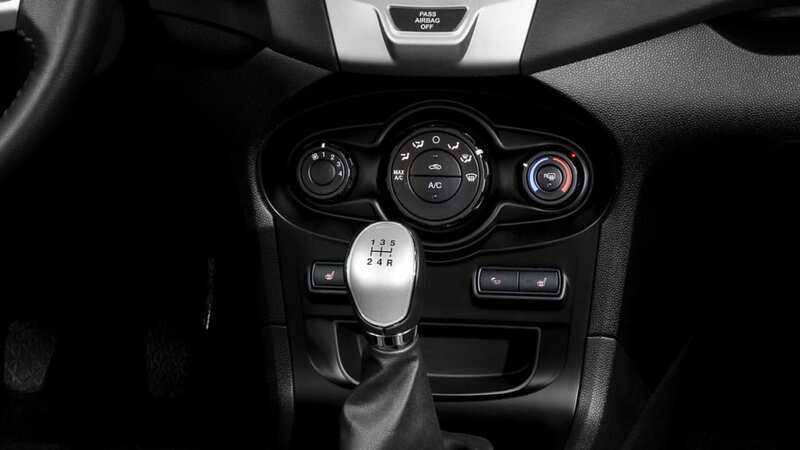 Fiesta's PowerShift transmission gives better fuel efficiency than a traditional torque convertor automatic or manual shift transmission. "PowerShift is a transmission that changes the game," said Samardzich. "Our fuel economy leader is now a PowerShift automatic. Traditionally, a small car driver needed a stick shift and a clutch pedal to enjoy the greatest fuel efficiency." Twin internal clutches keep the PowerShift in constant mesh, continuously optimizing for maximum responsiveness and fuel efficiency, depending on engine speed, vehicle speed and input from the driver's foot on the accelerator pedal. 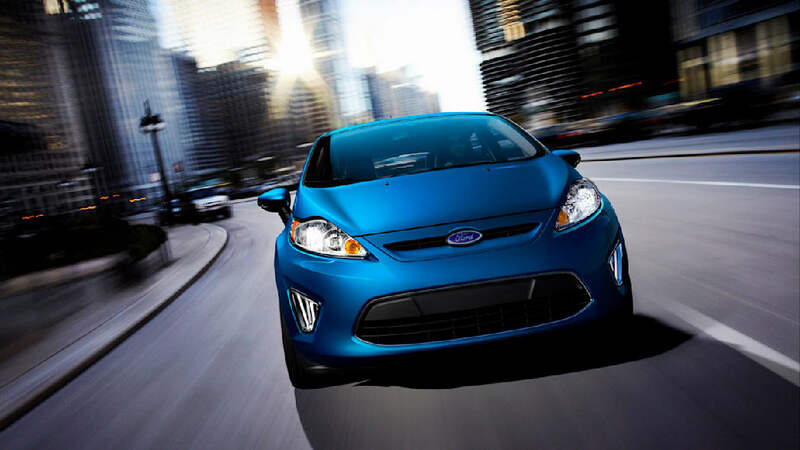 PowerShift is a dual dry clutch transmission, operating with sealed internal lubrication, reducing friction and adding to Fiesta's fuel economy. The lack of pumps and hoses reduces complexity, saves weight and contributes to fuel efficiency. Simpler, more responsive and more fuel efficient than a conventional four-speed automatic transaxle, PowerShift represents an innovative small car breakthrough. For some small car drivers, the experience isn't complete without being given the choice of shift points. Fiesta offers customers a standard five-speed manual transaxle with the ideal combination of gearing to provide swift acceleration from rest, responsive power at mid-range speeds and relaxed highway cruising in the overdrive fifth gear. Hydraulic actuation makes for smooth engagement with an easy-to-modulate clutch pedal, reduces the potential for slip and helps fuel economy. 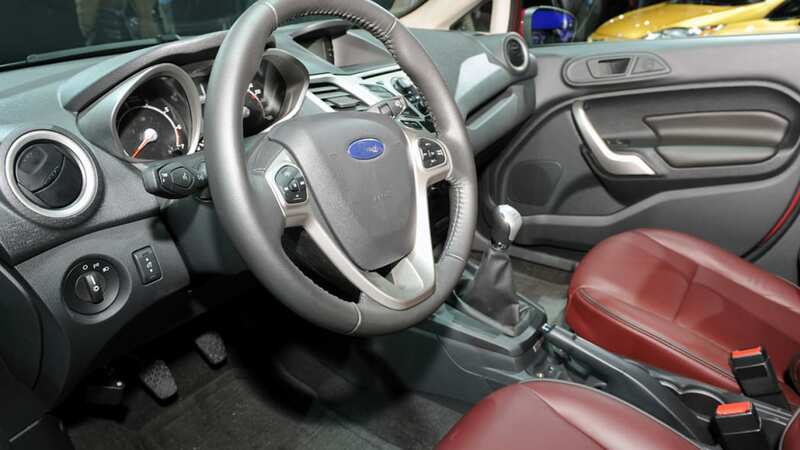 Fiesta features Electric Power Assist Steering (EPAS), which decreases complexity, saves weight and improves fuel economy by significantly reducing parasitic drag on the engine in comparison to traditional hydraulic power-assisted steering. 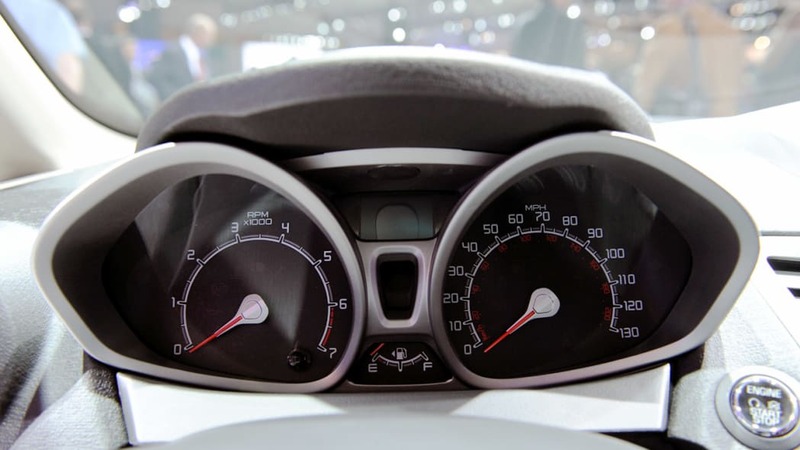 EPAS is speed-sensitive, providing optimized assist based on vehicle speed, steering wheel angle, cornering forces and acceleration or deceleration. 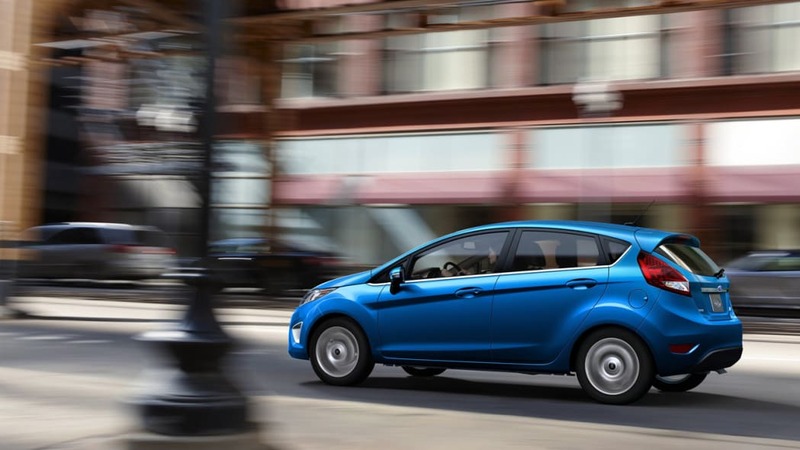 For the Fiesta application, EPAS is tuned to provide an engaging driver experience. EPAS enables Pull-Drift Compensation to help Fiesta track true. This software-based technology detects road conditions – such as a crowned road surface or blustery crosswinds – and adjusts the EPAS system to help the driver compensate for the pulling and drifting these conditions can cause. Pull-Drift Compensation is designed to be imperceptible to the Fiesta driver. In addition, EPAS enables Active Nibble Cancellation. This technology senses for irregularity in wheel balance and the related steering wheel vibration – or "shimmy" – it can cause. Like Pull-Drift Compensation, Active Nibble Cancellation is designed and integrated to be seamless and unnoticeable to the driver while sensing and compensating for rotational oscillations due to wheel balance issues or uneven brake rotor wear. The front-wheel-drive Ford Fiesta features MacPherson Strut front suspension. Tuned front shock absorbers – combined with a 22-mm front stabilizer bar – work in harmony with the EPAS system to preserve Fiesta's European road holding and handling dynamics. In addition, Fiesta features a twist-beam rear axle that provides the optimum combination of responsive handling, smooth ride and excellent space utilization. Specially tuned rear shock absorbers complete the package. 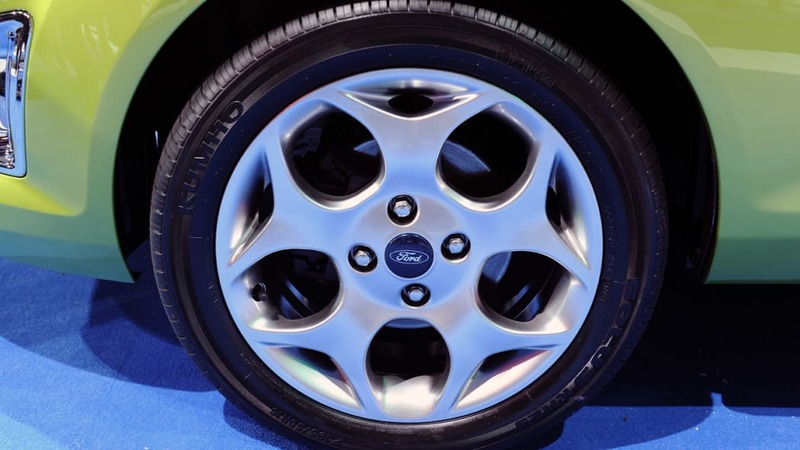 Like its European and Asian counterparts, the North American Ford Fiesta features front disc and rear drum brakes with ABS functionality. 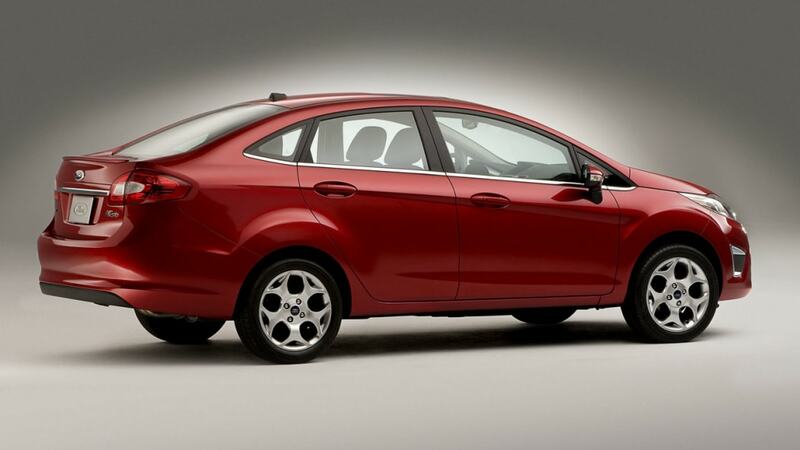 Depending on series level, Fiesta offers 15- and 16-inch wheel options, fitted with grippy, all-season tires. A 17-inch Ford Racing wheel package is offered as well. Fiesta's powertrain and driving dynamics combine to provide the ideal balance between exceptional fuel economy – up to a projected 40 mpg highway – and responsive performance with world-class handling and responsiveness. 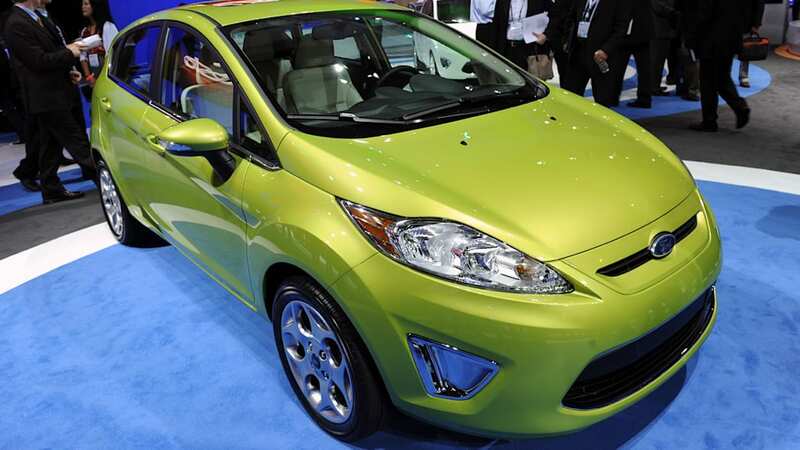 LOS ANGELES, Dec. 2, 2009 – The 2011 Ford Fiesta arrives in North America, delivering a design that builds on Ford's global kinetic design theme. True to its heritage, the new Fiesta for North America retains many of the expressive design characteristics that have earned the car accolades around the world. "We're staying true to Fiesta's Euro-centric 'kinetic' design the world over," said Moray Callum, executive director for Design, The Americas. "This is a new direction for Ford in North America, building on the bold designs that set apart Ford's full lineup of vehicles. Fiesta sets the stage for more to come." Kinetic design language was introduced with the Iosis concept vehicle, representing an expansion of Ford's design portfolio. Fiesta brings this fresh, emotionally-compelling aesthetic to the North American small car market. "That's good news for customers," said Kevin George, Fiesta design manager. "Across international Fiesta markets, customers tell us they want a car that speaks to them," he said. "The Fiesta was designed to elicit an emotional response from the customer by creating a design that succinctly interprets the dynamic act of driving." 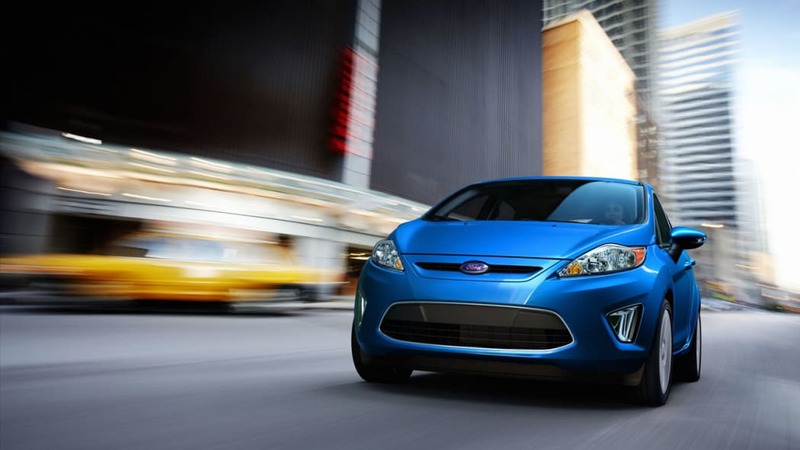 As a ONE Ford product developed for and sold in various markets worldwide, Fiesta brought global design teams together. "The global team spent considerable time developing sculptural surfaces, giving Fiesta a unique identity, added Callum. "The design is a reflection of today's Blue Oval, while confidently pointing to the future." 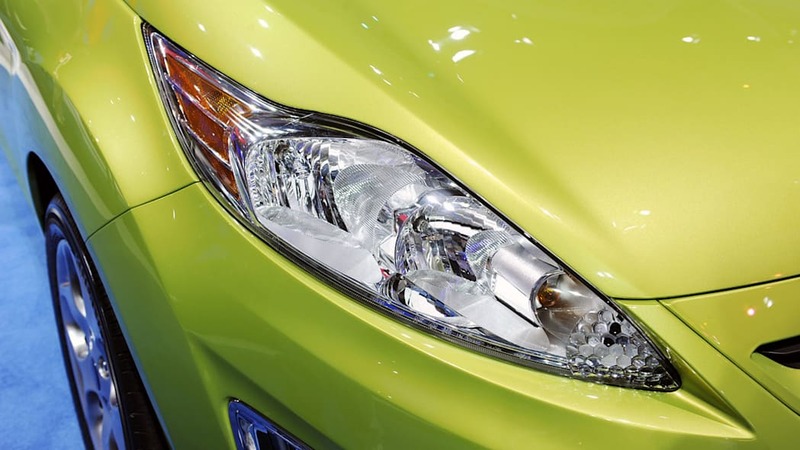 Sweeping, multi-element headlamps gracefully reach toward Fiesta's A-pillar, giving the car a confident – yet instantly recognizable – expression. 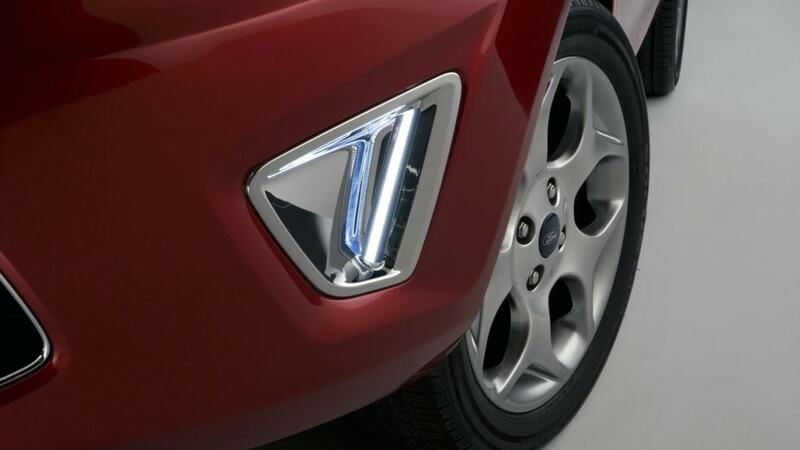 The diagonal flowing headlamp shape signifies motion and the dynamic act of driving even when parked. Prominent wheel arches reflect muscularity, athleticism and confident handling. "The five-door hatchback says 'sporty' in a distinctly European way," George said. "The four-door sedan uses kinetic design language to bring a forward-looking aesthetic to a more traditional profile." The five-door Fiesta retains the global grille opening, while the four-door employs Ford's North American signature three-bar look. 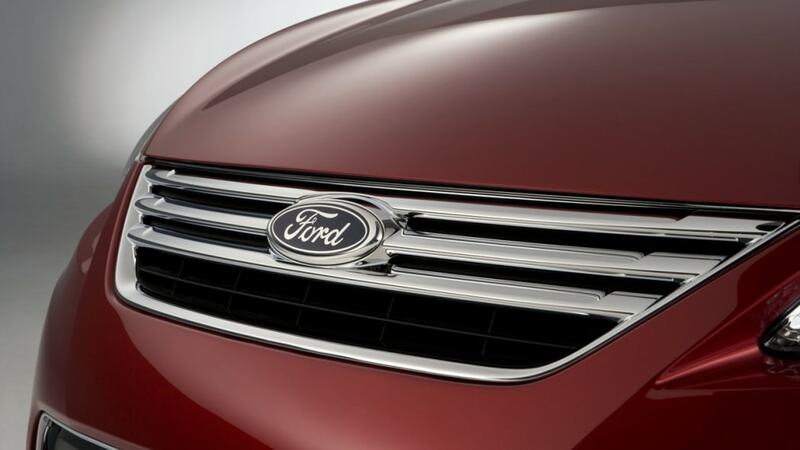 Continuity is reinforced by the familiar Ford logo centered in each variation along with the shared trapezoid opening of the lower grille, connecting Fiesta to other products in the Ford portfolio. 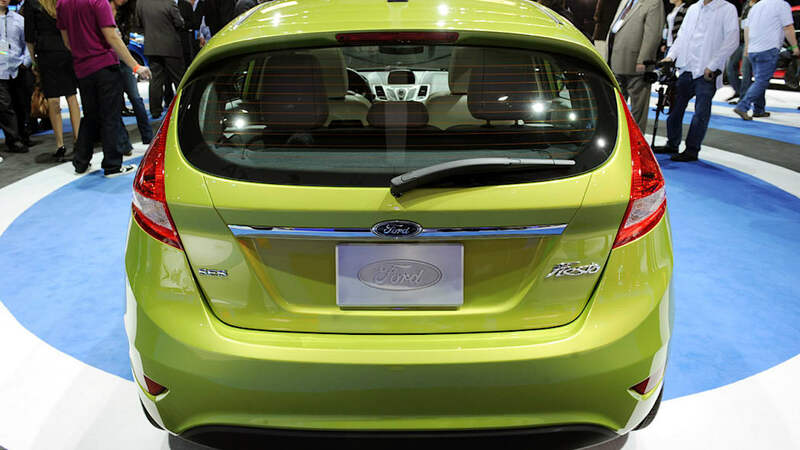 A standard spoiler sweeps rearward from the top of the five-door Fiesta's liftgate, while the four-door offers an available spoiler at the trailing edge of the trunk lid. Both spoilers provide aesthetic and aerodynamic benefits. Further benefits from aerodynamic tuning include a front chin spoiler with a smooth lower air deflector, directing airflow underneath and around Fiesta to reduce drag. Body-mounted, as opposed to sail-mounted sideview mirrors, reduce drag and wind noise. 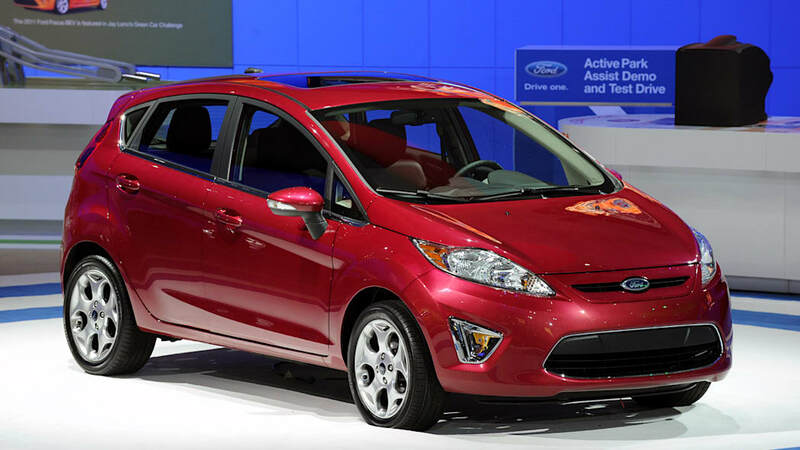 Fiesta represents an emotionally compelling yet aerodynamic form with a coefficient of drag as low as 0.33. 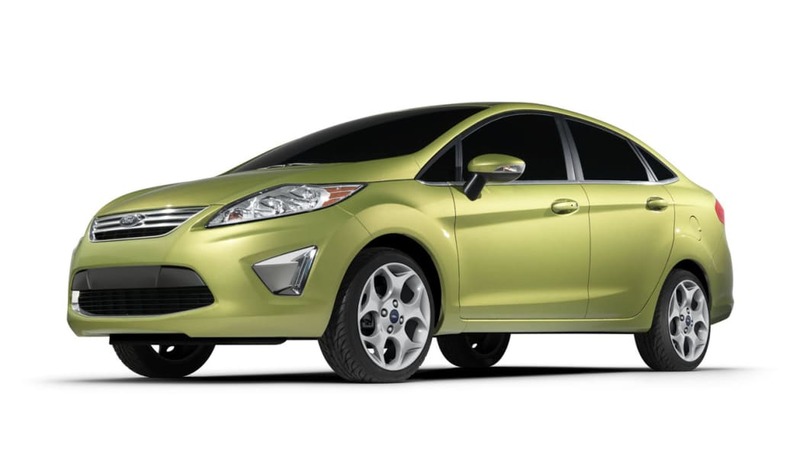 Fiesta comes to North America in a wide palette of colors that express its kinetic design language and driving dynamics. Yellow Blaze metallic tri-coat and Red Candy metallic tinted clearcoat are premium paint options beyond a standard array of hues that include Lime Squeeze metallic, Bright Magenta, Blue Flame metallic, Monterey Gray metallic, Tuxedo Black metallic, Ingot Silver metallic and Oxford White. 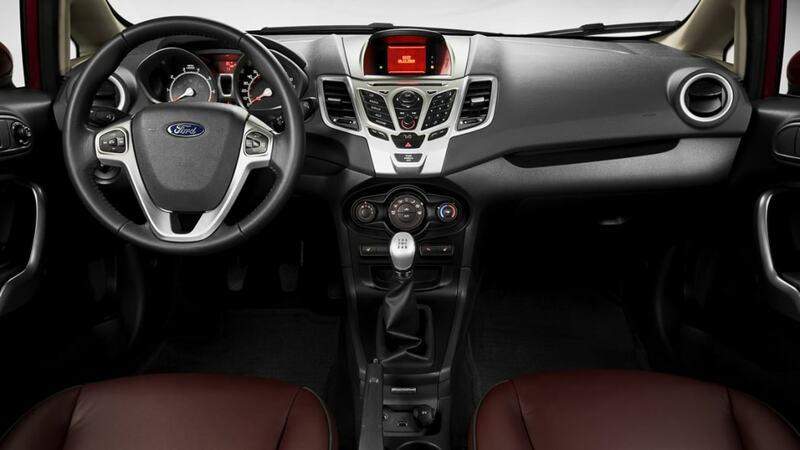 The Fiesta interior also delivers aesthetically on the promise of its exterior looks. Just as the exterior imparts motion, the interior is place where the dynamic act of driving is performed. 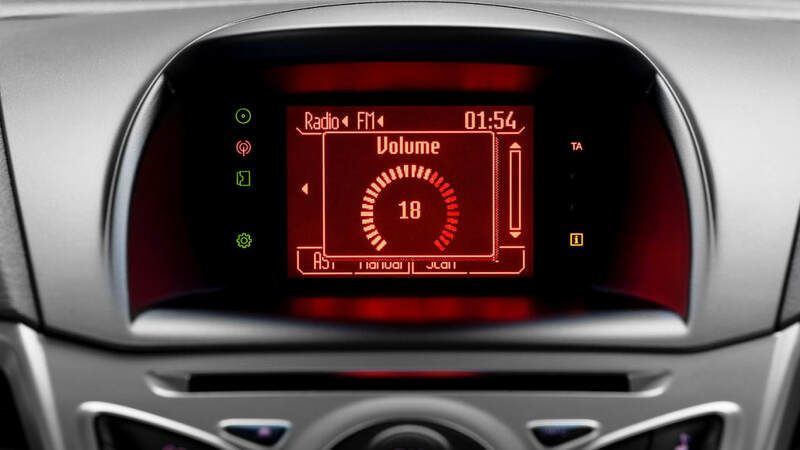 Designed to invoke the same familiarity and usefulness as a cell phone's interface, the car's centerstack represents the focal point of the car, and houses switches, audio and HVAC controls. Cloth and leather seating surface alternatives harmonize with contrasting environment colors to make Fiesta's interior a modern home. Series-level variations offer accents including contrast piping for leather arrays. 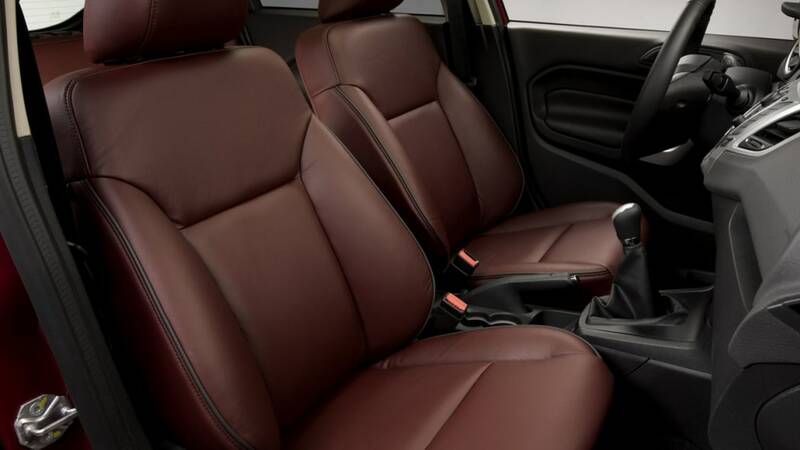 Rich blacks, cashmeres and plum interior hues subtly remind drivers that small and fuel efficient does not have to mean a compromise of style and good looks. 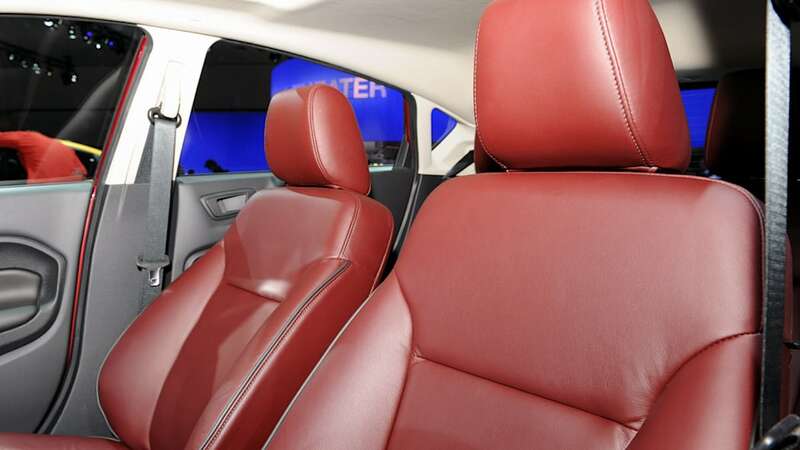 For additional interior color accents, available ambient lighting allows mood shifts among seven color choices. Fiesta interior fabric inserts include 25 percent recycled material allowing green sensibility to prevail regardless of exterior color. "Fiesta is going to be a game-changing product for North America," said George. "Fiesta will be a dynamic, premium small car that elicits an emotional response from both observer and driver." 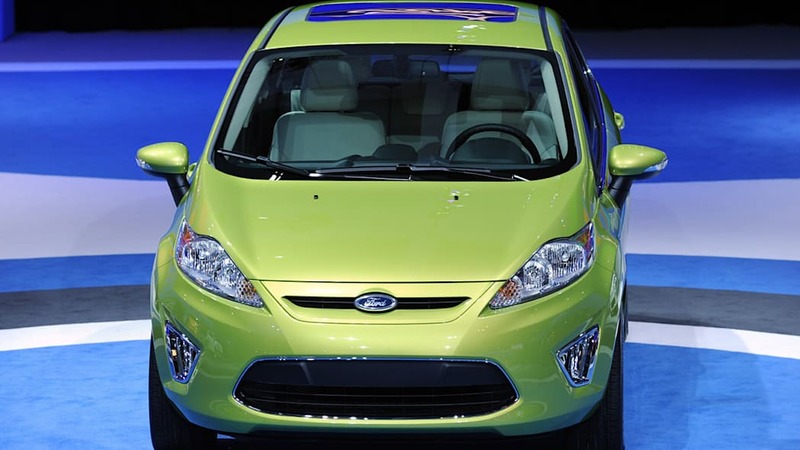 LOS ANGELES, Dec. 2, 2009 – Ford leveraged the global engineering tools and processes used in the redesign of its top safety-rated flagship – the 2010 Taurus – to raise the bar on small car safety with the new Fiesta. Incorporating the Trinity front crash structure, Side Protection And Cabin Enhancement (SPACE) Architecture® and advanced air bag technologies, Fiesta brings world class safety in a small platform package, while kicking off the global roll-out of the Taurus crash safety approach. 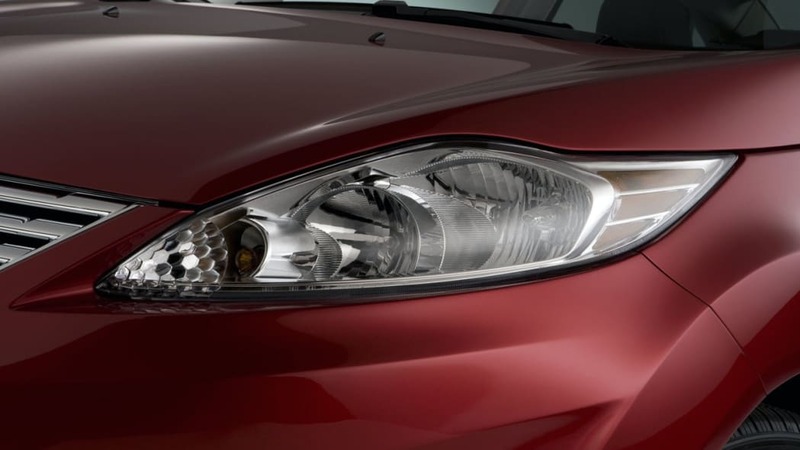 The new Fiesta's expressive body is rigidly crafted with high-strength steels that form an advanced crash structure. The Fiesta also features the most standard air bags in the segment and standard stability control. 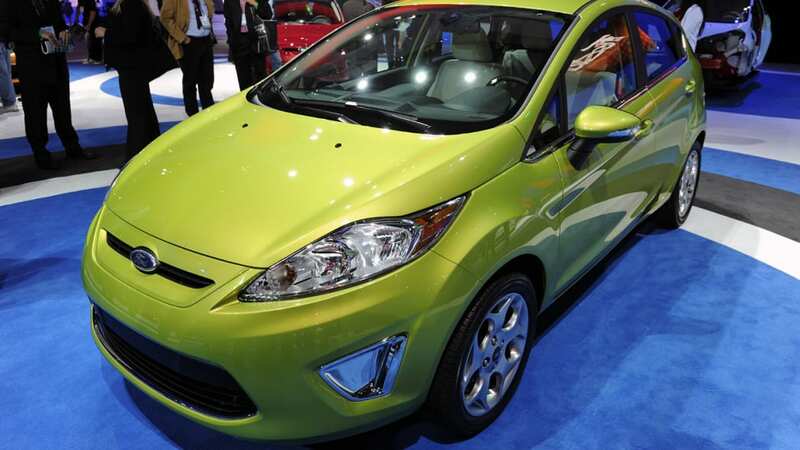 "Fiesta is proof that a small car can deliver big safety," said Steve Kozak, chief safety engineer. "The North American Fiesta combines rigidity, more air bags – smartly deployed – than the small car competition as well as standard stability control." Beneath Fiesta's stylish exterior is a robust structure, crafted from high-strength steels engineered to preserve quality and enhance driver and passenger safety. Working together with SPACE Architecture® side-impact protection, these elements form a protective safety cage to help protect Fiesta occupants in a crash situation. 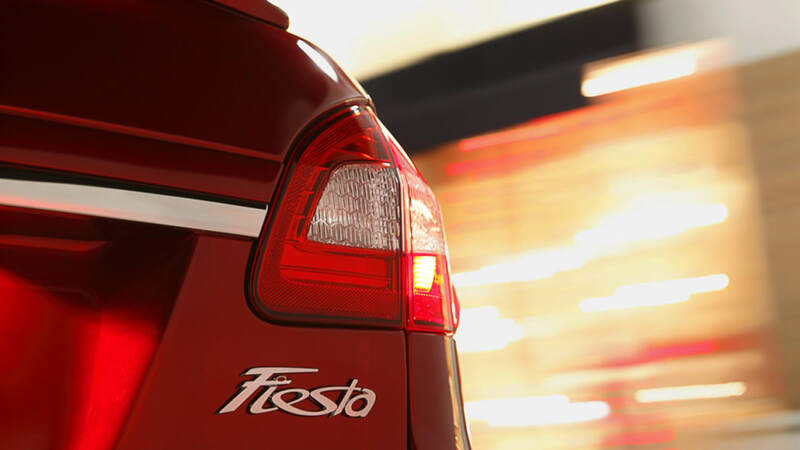 Fiesta uses significant cold- and hot-formed high-strength steel in the body structure. These components add rigidity and save weight, increasing structural efficiency while also helping Fiesta deliver high fuel efficiency. More than 50 percent of Fiesta's body structure uses these high-strength or ultra-high-strength steels in the floor structure, front rails, beams and in the ultra-rigid, integrated body reinforcement ring designed to help better protect occupants in side impacts. The Fiesta A- and B-pillars are fashioned from ultra-high-strength aluminized boron steel, adding robustness while allowing for slim width and rake to honor Fiesta's distinctive design. Rocker panels – with welded baffles to absorb impact – also are crafted from very high-strength, dual-phase steels, known for their energy-absorption qualities. The side roof arch employs dual-phase steel construction. Fiesta's under-floor support beams – so-called sled runners – and lateral floor reinforcements also use high-strength, dual-phase steel. These light but strong metals in the Fiesta's robust body shell help enhance crash protection by adding strength, rigidity and durability. 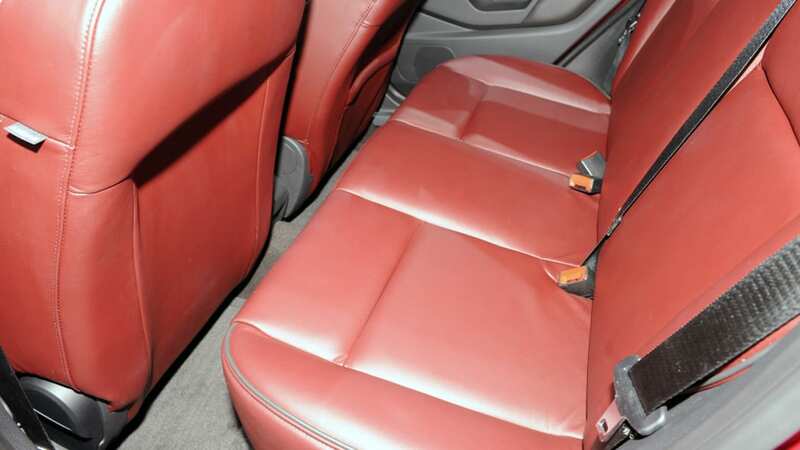 The Fiesta body shell is well-equipped with safety features to help protect its occupants in the event of a collision, including the most standard air bags in the small car segment. Fiesta offers a segment-exclusive driver's knee air bag, developed to help reduce lower leg injuries in the event of a frontal collision and to work together with other safety features. 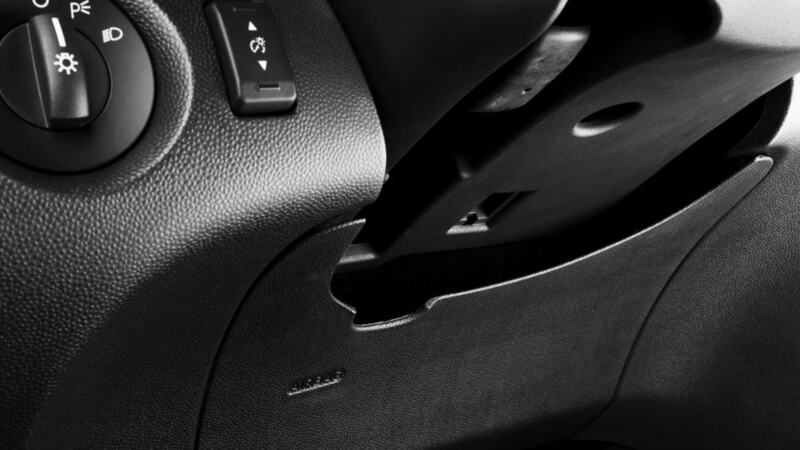 The knee air bag joins a suite of Fiesta safety features including dual-stage first-row air bags, side-impact air bags and side curtain air bags. A knee air bag won't be found in Honda Fit, Nissan Versa or Toyota Yaris. Move up to Civic, Sentra and Corolla and you still won't find a driver's knee air bag. "Smart" Passenger Occupant Detection System (PODS) sensors determine occupant weight and safety belt status to optimize deployment force. Smart sensors include the class-exclusive side impact sensor that uses pressure to react up to 30 percent faster than previous sensor offerings. 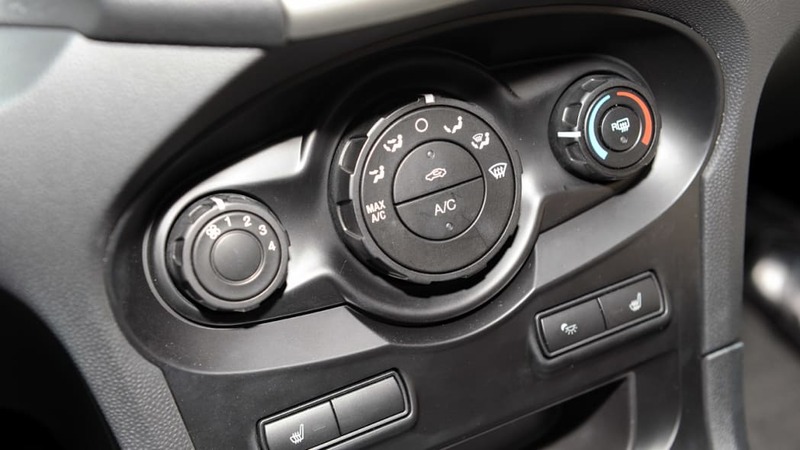 Also available on the Fiesta is Ford's AdvanceTrac with ESC® (Electronic Stability Control), which uses sensors to detect and measure yaw, or side-to-side skidding conditions, by monitoring the vehicle's speed, throttle position and steering wheel angle. When AdvanceTrac senses wheel slip, engine torque is reduced and braking is applied, where needed, to help the driver keep the car tracking on its intended path. Additional features include rear door child safety locks, height-adjustable retractable seat belts with pretensioners and a Tire Pressure Monitoring System (TPMS). Early indicators suggest that Fiesta will attract tech-savvy young drivers. 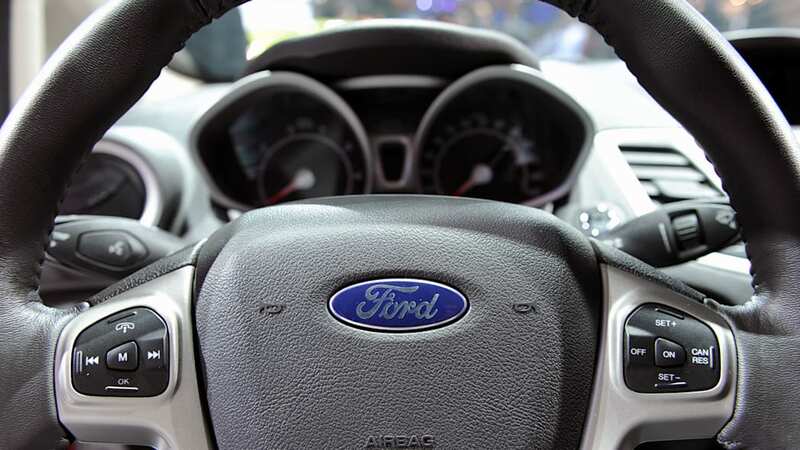 Ford encourages drivers of all ages to keep their hands on the wheel and eyes on the road by using Ford's SYNC® hands-free, voice-activated communications and entertainment system which is optional on the Fiesta. Ford research shows that SYNC significantly reduces the level of distraction when drivers select a phone number or choose a song on their MP3 player compared with the same operations used in hand-held cell phones and music players. Ford's global safety engineers worked together to prepare the Fiesta to meet stringent U.S. crash protection requirements by leveraging Ford of Europe's small car expertise as well as an array of virtual, actual and hydraulic sled-simulated crash tests. "Ford has been sharing safety processes and technology around the world since the 1990s," said Kozak. 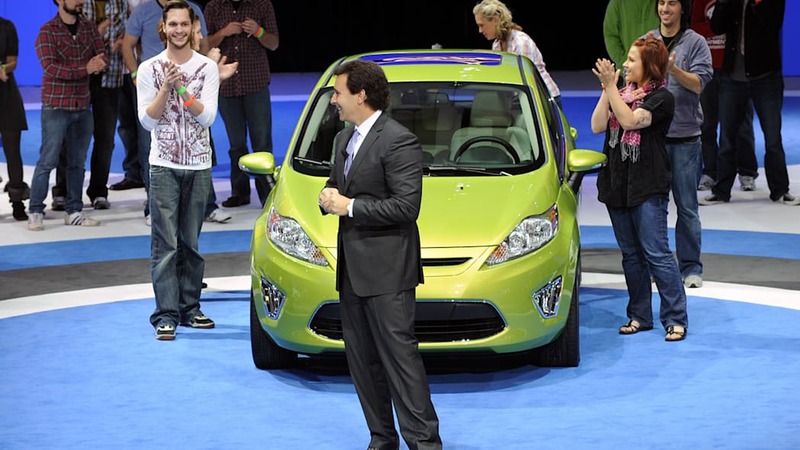 "This has laid the groundwork for us to quickly manage complex regulatory and crash-testing differences between Europe and the U.S. as we accelerate the introduction of exciting, fuel-efficient products such as the new Fiesta and next-generation Focus in the U.S."
LOS ANGELES, Dec. 2, 2009 – Ford Fiesta arrives in North America with a globally proven platform and package ready to change customer expectations about small car quality and noise, vibration and harshness (NVH) control. 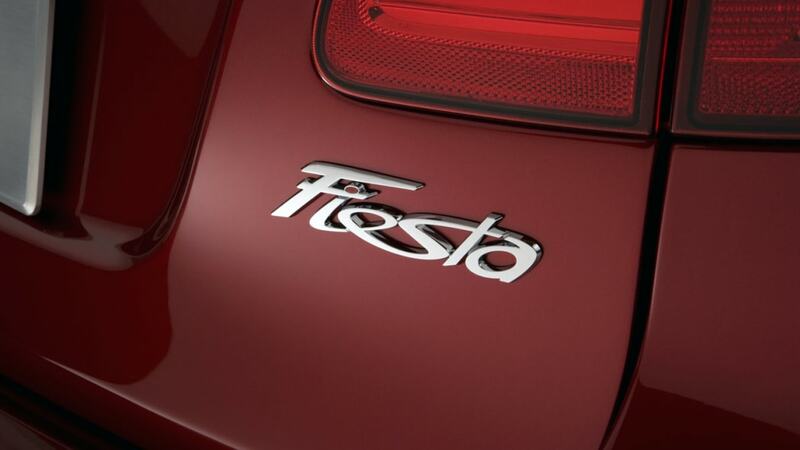 "Fiesta is all about design, performance and fuel economy benefits," said Steve Pintar, chief nameplate engineer. 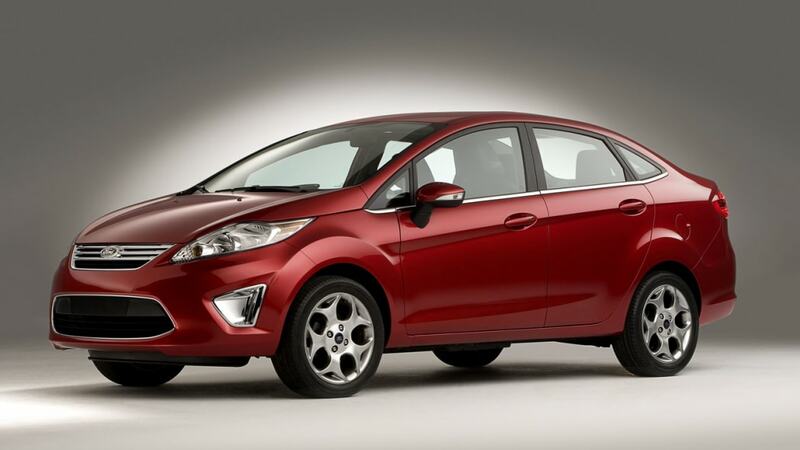 "Fiesta doesn't ask a customer to compromise quality or refinement." Ford accelerates its global product development strategy with Fiesta, where vehicles are developed from the outset to appeal to customers in all markets where Ford competes. Fiesta is yet another ONE Ford vehicle and foreshadows the next global Focus. Fiesta arrives with kinetic design, a successful global platform crafted from high-strength steels and minor detail improvements. Its rigid body structure was adapted to meet unique North American safety standards while honoring the global design language. Engineers then tweaked it to be even quieter. "The performance and driving dynamics of the European model have been preserved," said Pintar. "We added the revolutionary new PowerShift transmission to reach 40 miles per gallon and made the car quieter. The North American Fiesta represents the best of our global efforts." North American Fiestas include NVH control enhancements that improve on global market versions with additional sound baffles and the relocating of the antennae to the rear of the roof panel for wind noise reduction. 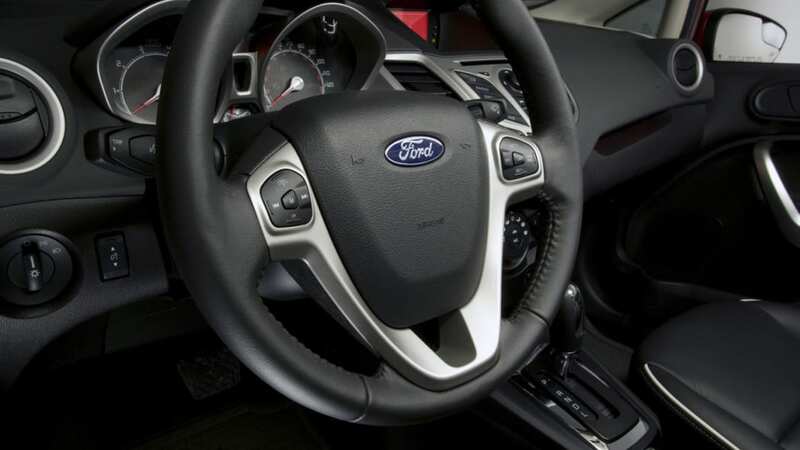 Fiesta's biggest single North America-specific NVH control feature is the acoustic laminate windshield, designed to reduce interior noise levels. This class-exclusive feature is unexpected in the Fiesta competitive set. In addition, the North American Fiesta offers the hood blanket developed for the European-market diesel version, offering an additional noise buffer. 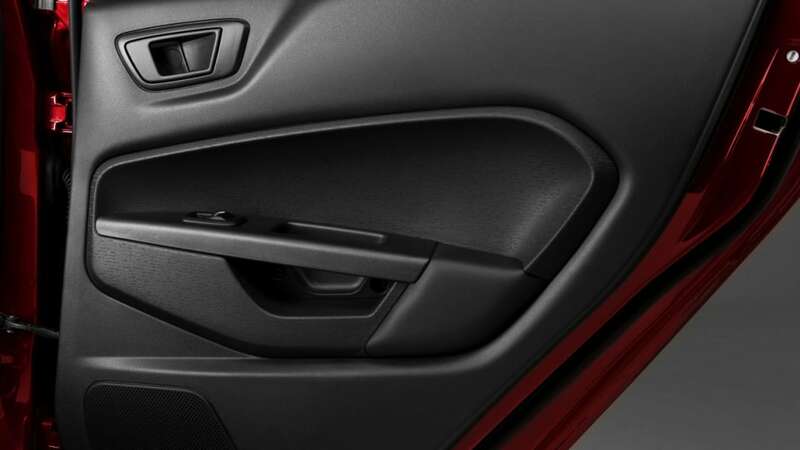 Specific door seals were developed for North America, providing tighter closures and contributing to reduced wind noise. These seals have been integrated into the global Fiesta. Fiesta noise also is reduced by a downward-facing hidden-tip exhaust tailpipe and a headliner developed to absorb and mitigate potentially intrusive sounds. More than 500,000 Fiestas have been sold around the world. 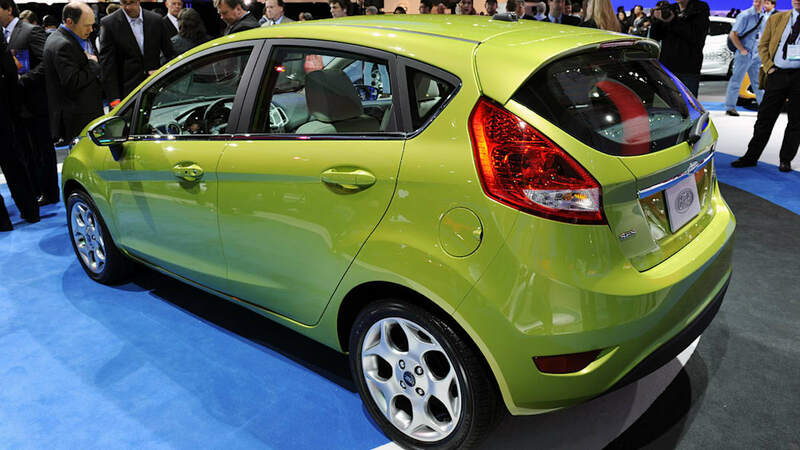 But before a single customer took delivery, Fiesta earned its stripes in extensive durability testing. While the shift to computer-aided engineering has reduced development time and the number of prototypes built, the durability testing became more stringent. Prototype Fiestas logged more than 2 million miles of on-road testing finishing with 20 production-level vehicles placed among worldwide test customers, considered high mileage accumulators, logging up to 60,000 miles per year. Fiesta was subjected to more than 550 component and system laboratory tests to verify durability, functionality, serviceability and sustainability over the vehicle's lifetime. Doors, liftgate and hood were each operated more than 300,000 times in real-world conditions including dirt, dust, salt and humidity across a variety of temperature ranges and extremes. The goal: Use those tests to help create an on-road life of 10 years and 150,000 miles. Then it became a movement. Ford kicked off the Fiesta Movement 11 months before the car's North American introduction. The Fiesta Movement, a Ford social media program, put European-spec Fiestas in the hands of 100 socially vibrant people, those using the internet to tweet, Facebook, blog and post video. Fiesta Agents delivered with benefits. To date, Fiesta agents have driven more than 1.1 million miles while performing athletic, cultural and philanthropic missions, then blogging and posting video clips about their experiences. Fiesta buzz is building on a foundation of social media word-of-mouth interactions. Fiesta recognition stands at 58 percent among those that consider themselves a potential B-segment prospect – impressive for a global nameplate unavailable in North America since 1980.